The club are delighted to announce the signing of Rabin Omar for season 2017/18. 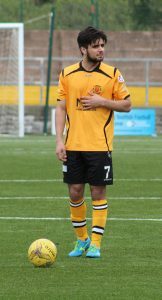 Manager Peter Murphy has regained the services of the forward for what will be his fourth season at Galabank. Rabin made his debut in 2014 as a 17 year old and has now established himself as a regular fixture in the starting eleven. His most memorable moment to date came in the historic Scottish Cup win over SPFL Premier League side Hamilton where he scored two goals before being asked to appear on BBC’s Sportscene.